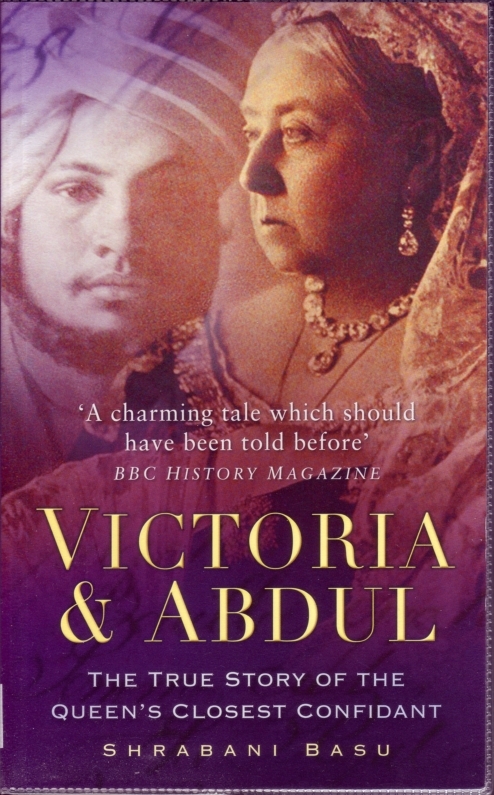 A Review of Shrabani Basu's "Victoria & Abdul: The True Story of the Queen’s Closest Confidant"
our years after the death of her loyal servant and confidant John Brown, which had again left her bereft, Queen Victoria decided to have servants brought from India during her Golden Jubilee Year in 1887, when she expected a large number of Indian princes to come for the celebrations. John Tyler, Superintendent of the Agra Jail, who had just returned from London after attending the Colonial and Indian Exhibition (1886), was asked to find the right people. He felt that his twenty-four year old assistant clerk, Abdul Karim, would fit the role. Karim, along with another Indian servant, Mohammad Buksh, boarded a ship on 20 May 1887 and duly arrived in England. They took up their roles among unfamiliar people and alien surroundings in the Palace. They were to be the personal servants of the Queen at an annual salary of £60 each. Their job was to wait at the Queen’s table at mealtimes. On meeting her Indian servants, the Queen was especially struck by Karim who was a six foot tall handsome young man, dressed in a red tunic, with a colourful turban and an exotic waist-band. Karim belonged to the lower middle-class, had little education in his native land and had only a smattering of English. The Queen of course knew no Indian language; but she decided that Karim, who soon became her favourite, would have lessons in English conversation, and she herself would learn Hindustani from him. Thus started the tutor-pupil relationship which lasted until she died, by which time she was able not only to speak to him in his native language but also to compose detailed diary entries in Urdu, in what she called her Hindustani Journal. Through Karim the Queen started to get interested in Indian people and things in general. On his part, Karim began by introducing her to Indian food which the Indian servants had started to cook for themselves as soon as they arrived in England. One day, Karim went to the Royal kitchen with a bag of Indian spices and prepared several Indian dishes. The Queen tasted some of them and liked the exotic food with, or despite, its pungent aroma. Soon, she began to have curry for lunch. She got to know not only the language and food, but about ordinary life in India from Karim, who spoke to her about his country, its people, traditions and customs. As a member of the minority Muslim population in India, he also told her about the conflicts between the Hindus and Muslims there. On various occasions he was to ask her for her support for his religious cause in India. She of course did not have any political power but she listened to his stories with compassion and sympathy. He, on the other hand, gave her (a widow still in mourning) the companionship with which John Brown had previously provided her for more than twenty years. Thus started a most remarkable relationship between the Queen and her Indian subject, which is the theme of Shrabani Basu's very well researched book. Basu has culled details from little-known sources, and has printed rare photographs and facsimiles of documents, including specimens of the Queen’s handwritten documents in Urdu. Thus, a hitherto unknown, or little known, part of Victoria’s domestic life has been unveiled. It also opens a window into the human personality behind the regal presence, because, despite the vast differences in their respective lives and position, she treated Karim as a fellow human being, not just a servant. Before long, Karim not only served her food but also helped her in various ways. He helped her with her official work relating to her correspondence, and with her official “boxes” which came to her from the administrators of her country. Increasingly she came to rely on him. She brought in more Indian servants so that Karim could be free from menial tasks. Karim achieved a greater fluency in English while she made progress with her Hindustani. Very soon both were able to communicate with each other more easily. She felt that he should be promoted to the rank of a “Munshi” — i.e. clerk or tutor. Though the title had no official recognition, the people the Queen came in contact with gave due respect to it. Karim acquired the accessories and privileges which went with his position. He had his own carriage and his own separate houses in the Royal Palaces of Windsor in England, Balmoral in Scotland and Osborne House in the Isle of Wight. Karim now moved among the higher circles as the Queen’s “Secretary.” He was awarded various honours, including the CVO which could be given by the Queen at her personal discretion. She could not promote Karim to what he really aspired to — the knighthood — because that was in the hands of the prime minister and his advisors. Karim’s rapid rise to favour led to jealousy among the other Indian servants and, more seriously, among the members of the Queen’s Household, who described him as repulsive and disagreeable. Racial feelings crept in, and members of the Household started to talk about the prevalence of the “black brigade” in the Palace. The Queen was outraged and forbade all such talk and propaganda. Much to the displeasure of the Household, the Queen did not recognize any class or racial barriers between herself and her Indian servants. As she got to know them, especially Karim, the Queen developed a great affection for India and the Indian people. It is the special merit of Basu’s book that it illustrates and documents this fact in the Queen’s life very convincingly. Victoria deeply regretted the fact that, because of old age, she could not visit India. She had become familiar with the Indian princes and several of them paid visits to her regularly, and she decided to build an Indian extension to Osborne House, called the Durbar Room, where she could receive them with appropriate ceremony. She appointed an Indian architect Bhai Ram Singh who drew out the plans for it. When completed, it became a magnificent addition to the Palace, with its glittering Banquet Room, a Billiards Room and the Queen’s own India Room. It was decorated with arts and crafts from India and its walls and corridors displayed rich and colourful portraits of Indian princes. Several Indian princes visited her there. Karim himself continued to get special favours from the Queen: he now travelled in style in his own carriage, accompanied by a footman; and when she travelled to Europe, he was given a spacious room all to himself on the same floor as the Queen. Despite the welcome that her foreign hosts gave to her and her entourage, they sometimes flinched at the latter. At home, all this aroused envy and anger not only among her own Household but also among the other Indian servants who all lived at a much lower level. That a servant belonging to the subject race, of low origin and with practically no education should have been elevated among the members of the Household was regarded as highly suspicious and unjust. But the Queen remained supremely untouched and continued to bestow generous favours to him. It must also be added that Karim too remained steadfast in his loyalty and devotion to her till the very end. The end came on 22 January 1901 when the Queen died at Osborne House. With her demise, ended, almost abruptly, the special connection that the English Royal Family had established with India. At her funeral, Karim was pushed back in the line of mourners. He was in fact the last man to enter her coffin chamber. Only days after, the new King Edward sent his emissaries and guards to Karim’s house at Frogmore in Windsor and asked him to surrender all the letters and papers connected with the Queen in his possession. They were all confiscated and burnt, and Karim was peremptorily ordered to leave England. So too were all the other Indian servants in the Palace. Suddenly, the colourful turbans and the smell of curry disappeared from the royal scene. Basu, Shrabani. Victoria & Abdul: The True Story of Queen’s Closest Confidant. London: The History Press, 2011. 286pp. £9.99 (pbk). ISBN 9 780752 458533.